San Diego Botanic Garden is home to this unusual and beautiful arboreal creation. San Diego Botanic Garden is home to this unusual and beautiful arboreal feature. TREES IN ART? We see them quite often, in paintings, sculptures, neon signs, funky installations, drawings, textiles, and jewelry, too. But creating an artwork out of a tree is a far rarer thing, and, quite often, delivers as much of a story as any imagined tree that's been creatively captured by oils or watercolors or a weaver's loom. And there is such a tree, with such a tale, at the San Diego Botanic Garden in Encinitas, a handsome specimen that has now become a sculpture. The..
EUCALYPTUS CLADOCALYX... was planted a century ago, in 1918, but it "... had to be euthanized last year because it was leaning dangerously" and "posing a threat to visitors," revealed the SDBG. But staffers wanted to keep the storied and stately tree close, given its garden history and beauty, and the choice was made to provide it a second path as an artwork. 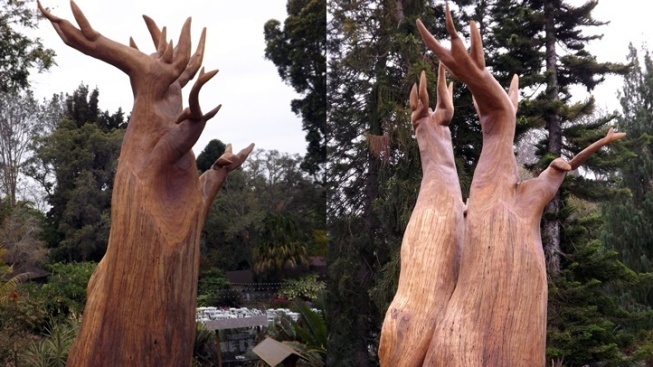 The garden contacted artist Erwin Young "Mitch" Mitchell IV, who soon began work on the 30-foot-high stump (the original tree stood at 100 feet). The artist's vision for the stump? A "stylized version of a Baobab Tree," an eye-catching piece that could prompt visitors to pause in wonder. WORK ON THIS TREE TREASURE... wrapped near the close of May 2018, meaning those who saunter at SDBG can view it. Find it in the Madagascar Garden, where its new Baobab-inspired shape fits in quite well (Madagascar is home to many beautiful Baobabs). Where else can you see Mr. Mitchell's work? He created the Hodgee Monster at Lake Hodges, a sculpture fashioned out of a Eucalyptus tree that was deceased. San Diego Botanic Garden also points out that a few trees around the 37-acre spread are "... reaching the end of their life spans," including a "rare Torrey Pine towering above our Tropical Rainforest," so be sure to stop by and see these gems before they're removed, a process that allows new plants and shrubs to grow.